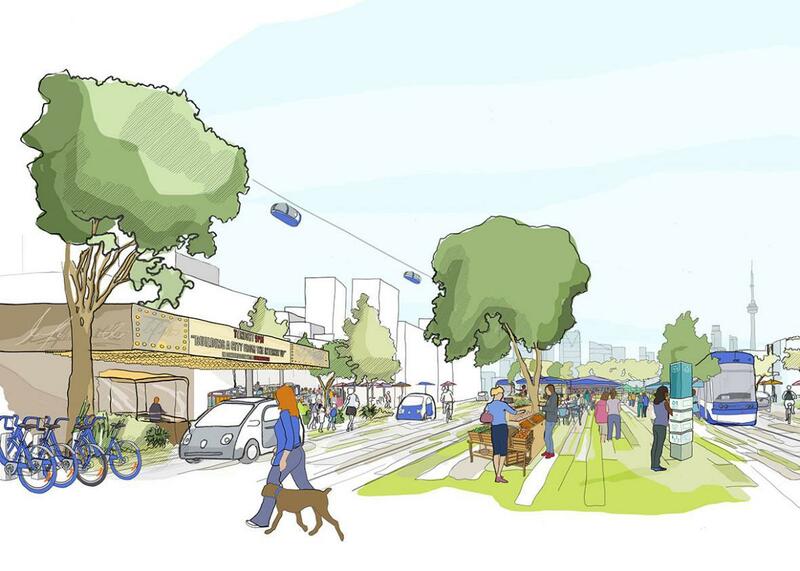 Sidewalk Labs’ Quayside development in Toronto is Google’s first shot at building a city. What matters in city-building isn’t high-tech data—it’s boring old infrastructure. But since Sidewalk struck a deal last week to develop an 12-acre parcel on the Toronto waterfront, Doctoroff’s observation sounds a little different. It is less that the company thinks these yokels could never appreciate this Manhattan-sourced innovation. It’s more that the most bang for your buck in city-building—even for an information company—comes in utilities and structural engineering, not putting sensors on lampposts. Sidewalk describes its vision for Quayside in terms worthy of Blade Runner, as a city “built from the internet up … merging the physical and digital realms.” In reality, the company’s ambition lies first in the synthesis of established techniques like modular construction, timber-frame building, underground garbage disposal, and deep-water cooling. Not low-tech, but not rocket science either. Sidewalk’s success will depend on deploying those concepts at scale, beginning with a preliminary tract at Quayside but expanding—if all goes well—to Toronto’s Port Lands, a vast, underused peninsula of reclaimed land the size of downtown Toronto. The most fitting antecedent, then, is less Plan Voisin, Arcosanti, or some other utopian scheme for razing and rebuilding a society. As a synthesis of existing know-how deployed at scale and packaged for easy sale, Sidewalk Toronto is more like a modern-day Levittown. Before that Long Island GI community came to stand for Pete Seeger’s stultifying “Little Boxes,” it was the cutting edge in American construction technology and community design. And it was built that way both because the developers thought it would be nice and because they knew it could be cheap. That’s part of the pitch for Sidewalk’s Toronto neighborhood. The company calculates the cost of living in Quayside will be 14 percent lower than the surrounding metro area. It believes timber-frame construction, modular units that can be assembled on site, microunits, and cohousing can significantly lower housing costs. Other ideas, like mixing office, production, institutional, and residential spaces together in buildings, do not draw on technology at all. Many have tried to master-plan the vibrancy of an organic city; most have failed. You better believe a company named after Jane Jacobs has the lingo down: “The most exciting ways to activate the public realm are often a mix of traditional uses in flexible spaces,” the company’s proposal says. “The cafe that puts tables on the sidewalk, the teacher who uses a park for nature lessons, the artist who turns a street corner into a stage.” But is it really the case that that kind of street life can be built, as Sidewalk promises, on “a robust system of asset monitoring” that creates a reservation system for sidewalk space? No. The company hasn’t been able to negotiate with local politicians during the bid process, so in some ways the real scope of the venture will be defined by whichever code reforms Sidewalk can now procure from local and regional leaders. Meg Davis, the chief development officer at Waterfront Toronto—the public agency that sponsored the RFP and selected Sidewalk—says she thinks local leaders will be amenable to code changes in the service of a carbon-neutral community. Developers, she thought, would see Google as a trailblazer rather than the recipient of special dispensation.